Ultimately, you want to aim to drink more vegetable juices for its highly cleansing and healing properties that are effective for reversing many ailments and … melting away toxic fats. If you have clicked on this section first, I suggest you also read the fruit juicing section later, about why you should juice. The reasons for vegetable juicing and fruit juicing are the same, but vegetables have something much more important that fruits have less of — chlorophyll. When you hear the word “chlorophyll“, you may remember this word from Biology in school. To some of you, the word may mean almost nothing, other than the green thing in plants. 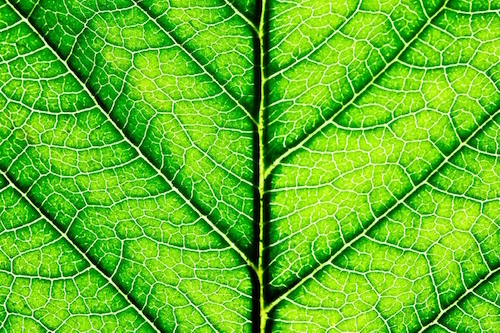 Yes, it is “the green thing” in plants, the phytochemical that makes plants green. But, it is also a very important proteinous compound that acts as our internal healer, cleanser, antiseptic, cell stimulator, rejuvenator and red blood cell builder, just as it is the “lifeblood” of the plant. Chlorophyll is a green photosynthetic pigment found in abundance in leaves of plants (vegetables). It absorbs sunlight and changes it into chemical energy for the plant. Studies have shown that chlorophyll molecule is remarkably similar to hemoglobin in human blood, the substance that carries oxygen in our body. 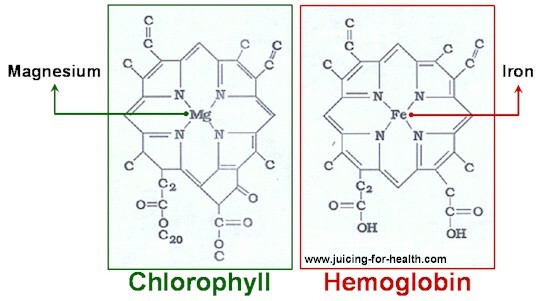 Except that our hemoglobin has an iron element in the center of the structure and chlorophyll has a magnesium element (see picture below). Experiments have shown that our body is able to convert chlorophyll into hemoglobin, thereby enriching the blood. The power of sunshine in chlorophyll is wonderfully cleansing in the body. The greener the leaves, the more concentrated the amount of chlorophyll. Go to this page for some quick tips on how to make tasty and healthy green juices. Besides chlorophyll, green vegetables also contain other equally amazing substances that work together in synergy, to heal. Only nature has a way of packaging groups of nutrients together that complement each other and when consumed, worked synergistically to repair, to cleanse and to heal. This is why it is so important that you ensure that your healing foods intake outweigh the amount of harmful foods. Only when this happens, your body can start to heal and you will begin to feel rejuvenated. But because there are only so much vegetables that we can eat in a day, >strong>we need vegetable juicing so that we consume ample amount for our body’s use, for repair and healing. to repair, to cleanse, and to heal … powerfully. When we juice, we are able to extract almost 100% of the nutrients embedded in the fibers. 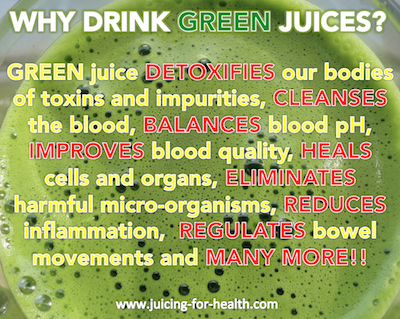 Properly extracted, the green juices are loaded with live enzymes, iron, magnesium, phosphorus, potassium and sodium. There are also pro-vitamin A, vitamin B-complex and vitamins C, E and K.
For example, you will be surprised that when you juice 100g of fresh spinach and 50g of fresh parsley (total of 150g), the green juice would yield much more iron than 300g of beef and more calcium than 300g of milk! Just imagine the amount of goodness you are consuming from these green juices! Moreover, the nutrients from these juices can be quickly assimilated and absorbed by your cells, not taxing on your digestive system. On its journey down the digestive tract, it does a quick spring cleaning of your system—it cleanses your blood of fungus, bacteria, yeast, parasites, and other toxic matters in the blood. Don’t we all need such cleansing? And what better way to do the job than with proper fruit/vegetable juicing? To get you conditioned with drinking green juices, let’s start with simple vegetables. Remember, your stomach must feel good after drinking these juices. If you feel queasy or nauseous after drinking any juice, then you must have taken a little too much for your body’s tolerance level at that particular point in time. In which case, try to take less of it the next time, and continue doing so, gradually increasing the amount each time, until you no longer feel uneasy. In time, when your body gets more cleansed of toxins, your tolerance level will increase. For vegetable juicing beginners, I usually suggest you start with a carrot and/or 2 green apples as the base. Add celery, cucumber, or lettuce, which are the easiest vegetables to drink. Ultimately, you want to aim to include more greens into your juices for its excellent healing properties. Include a slice of lemon when you juice greens to enhance the nutrients absorption rate and improve the juice taste. See this page for some great tips on how to make great tasting green juices. Get creative, the combinations are endless! While chlorophyll is found in all green vegetables, some of the richest sources of chlorophyll are from alfalfa, barley grass, chlorella, spirulina and wheatgrass. I cannot emphasize enough that we must have a variety in all that we juice, whether it be fruits or vegetables. This is to ensure that our bodies get all the various nutrients that we need. But with all the fruits and vegetables combined, the one element that is sorely lacking is vitamin B12. A strict vegetarian diet may cause vitamin B12 deficiency because this vitamin is largely found in animal products. A deficiency in vitamin B12 may result in pernicious anemia or neuritis (inflammation or degeneration of a nerve). To overcome this, you can either take a vitamin B12 supplement, or include chlorella (a kind of algae that has high content of vitamin B12) into your juicing. I do the latter as chlorella has much more health benefits besides providing my vitamin B12 supply. I like to crush the chlorella tablets into powder form and add them into my green juices. This way, all the health nutrients get absorbed by my body almost immediately. And it also allows for the vitamins synergy to take place at the same time.